The tilt-up construction procedure has gained massive support in the construction industry due to its swiftness and economic appeal. Over 650 million square feet are erected in the form of buildings through this method. So, what is tilt-up construction, and why is it so popular? This feature makes tilt-up construction the perfect choice for construction projects mid-city. Once the cast has cured, the elements are cut to size, concrete and rebar alike, and then ‘tilted’ to the vertical position with the help of a crane. Once it stands up, the bases are braced and secured in place with concrete. The braces stay in place until the rest of the structural components, including roofs, intermediate floors, and sidewalls, are set and secured. The method has gained popularity in Northern America, Australia, and New Zealand. Its usefulness is found not only when erecting retaining walls and supports on-site, but also for casting concrete elements at factories. In the early 1900s, Robert Aiken conceived the whole concept of tilt-up construction. While designing reinforced retaining walls at Camp Logan Range in Illinois, he got the idea of pouring concrete into wall-panels flat (like a cast) on the ground. Once the concrete dried, he titled the walls up, anchored them to the concrete footers and thus, tilt-up construction was born. Aiken started using this construction method in a number of buildings all over Illinois. Thomas Edison, the famous inventor, saw tilt-up construction as the future of construction; and created an entire village with the construction method in Union, New Jersey in 1908. The village is still standing to this day. The method gained true popularity in the 1940s, with the invention of mobile cranes, allowing the lifting of larger panels with ease. Since then, the tilt-up construction process has seen numerous technological upgrades and tweaks, making the method safer, economical, and much more convenient even in confined places. The tilt-up technique was famous for constructing warehouses and storage facilities, more than buildings in the post-World War II era. The invention of mobile cranes and truck mixers have had a huge impact on how concrete is mixed, and walls are set in place. Most people were concerned with the technique’s lack of surface design and their safety during earthquakes. However, as construction technology advanced, contractors started reinforcing the concrete casts on the floor and roof with steel bars. The method quickly spread far and wide, and schools, offices, houses, and hotels found the technique useful, safe and economical. Tilt-up construction boasts numerous advantages over traditional construction methods. It is the go-to option, for many a construction company erecting warehouses, retail stores, office buildings, storage facilities, and many other building projects. As mentioned above, this procedure works well even when constructing in crowded areas. Tilt-up construction work crews are typically smaller than those required for traditional construction – leading to reduced labor costs. If your building has a larger surface area, you can save even more thanks to the economies of scale. The fact that the crew can easily cast walls at the construction site can also help reduce transport expenditure. Once the building is complete, it requires less in terms of maintenance as well. This is thanks to concrete’s natural insulating ability, which helps in reducing the overall heating and cooling costs. Erecting walls and other elements via tilt-up panels is much faster than constructing walls via traditional techniques. There are no transport delays in the projects. Tilt-up concrete buildings are flexible, such that you can place the walls wherever you feel like they would fit better. The walls aren’t prefabricated, allowing each floor to be custom-designed according to your needs and preferences. You can add designs can on the top, and at the foot of the walls, after they have been erected to increase their aesthetic appeal. Decorative concrete is a good way to add texture to concrete walls, tackling the procedure’s lack of design concern. 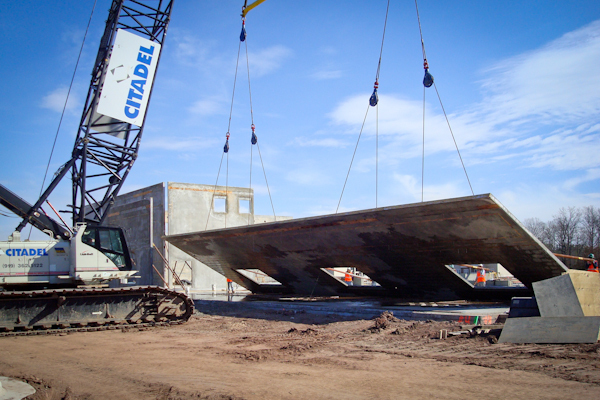 Tilt-up concrete buildings are extremely durable. A prime example of that is Thomas Edison’s village standing since the 1940s. The concrete walls themselves are much stronger than wood or cement blocks. However, the method is not considered safe for regions prone to earthquakes. Significant seismic retrofitting is required to make these structures more resistant to seismic activity, ground motion, or landsliding. Concrete, by default, is fire-resistant, and as mentioned above, a good insulator of heat. A 6.5" concrete wall can offer a fire-resistance rating of more than 4 hours. Since walls are cured before being tilted, you can inspect it for any weaknesses. If there are any cracks in the hardened wall, you can cast another one or simply repair it with an extra coat of concrete. In 2011, 45 tons in paneled walls collapsed under the immense wind power of the Joplin tornado. Many people criticized the practice in journals and magazines. The main cause for concern was the domino effect that tilt-up construction enabled, taking down numerous walls with the fall of one. The task force assigned to analyze the collapse found that the tilt-up construction method wasn’t to blame in the failure, it was the lack of bracing mechanisms that resulted in the catastrophe. However, the perception that the technique was unsafe prevailed. To enjoy affordability, versatility and convenience during the construction of your project, you should hire professional contractors approved by the Tilt-Up Concrete Association (TCA). For more information, visit Pennsylvania Aggregates and Concrete Association (PACA).